Many people, when they imagine solar energy, picture large photovoltaic arrays generating electricity for homes, businesses and communities. Although these photovoltaic systems play an important part in the alternative energy spectrum, they are not nearly as efficient as solar thermal systems used for pool and water heating. In fact, solar pool heating is the single most cost-effective use of solar energy in many climates, according to the U.S. Department of Energy. While photovoltaic systems convert the sun's light into usable energy, solar thermal systems generate energy by capturing and amplifying the sun's heat. Have you ever turned on a garden hose left in the sun and felt warm or hot water pouring out? That's solar thermal water heating at its most basic level. Heat from the sun will always warm the water in your pool to a certain extent. A Heliocol or SunStar solar pool heating system enhances this natural effect, simply and efficiently extending your swim season. 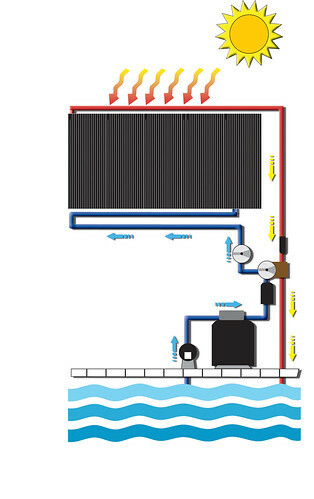 Heliocol and SunStar solar pool heating systems have three basic components: panels, a pump and a filter. A pump, usually your existing pool pump, pushes water through a filter to strain leaves and debris. Water is then pumped into a solar panel mounted on your roof, porch, fence, or any other location with good sun exposure (optimally south facing in North America). The water is substantially heated as it moves through the panel and it flows back into your pool, warming the water. Unlike solar water heaters for indoor use, solar pool heaters do not require a storage tank. Your pool provides all the storage required! As an added benefit, homeowners in hot climates can use Heliocol or SunStar solar pool systems to cool their pool in the summer months by circulating water at night, when air temperatures are lower. Solar hot water with no upfront costs? Hawaiian electric utility companies want state regulators to approve a solar water heating program that would provide renters and homeowners with immediate savings at no upfront cost. 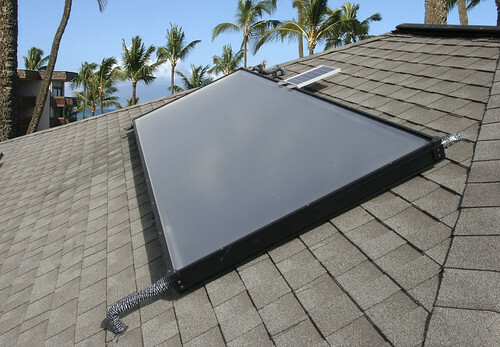 The Simply Solar program, proposed by Hawaiian Electric, Maui Electric and Hawaii Electric Light Company, would install solar water heating on qualified properties using utility company funds. Participants in the program would enjoy an immediate reduction in monthly bills while a portion of the electricity savings would go toward repaying the cost of the installation. Renters are typically unable to take advantage of solar water heating. Most landlords don't pay electricity bills for rental properties and they have little incentive to install money-saving systems. Under the proposed program, the savings and repayment would be attached to the property with no upfront cost to the property owner. Because water heating is the largest portion of most household utility bills, solar water heating can reduce monthly electricity consumption by 25 to 35 percent. Under the Simply Solar program, the savings would be greater than the participant's monthly payments, resulting in an immediate utility bill reduction. The proposal is currently under review by the state's Public Utilities Commission. Are you ready for a career in solar? 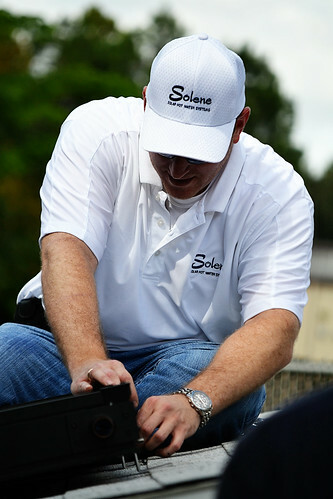 Are you ready for a career in solar in 2012? The Solar Energy Industries Association predicts that by 2016, increased demand for residential and commercial solar installations will add hundreds of thousands of U.S. jobs in research and development, manufacturing, construction, sales and marketing, and other fields. Have you considered joining the “green collar” workforce? Today's solar industry employs more than 100,000 Americans at 5,000 businesses across all 50 states. The majority of the companies that make up the industry in the U.S. are small businesses started by real people just like you. As more and more skilled labor professionals face under-employment and unemployment in the current economic climate, they are finding new, lucrative opportunities within the solar industry. With more than 30 years experience in the solar industry, UMA Solar can teach you the solar business from the ground up, using web-based, classroom and hands-on training in proven solar business concepts. UMA Solar offers full support and a turnkey business plan for individuals or companies of any size looking to succeed in the solar industry. Click How We Help to learn more about what UMA Solar can do for you.